THESE two words, Evolution and Revolution, closely resemble one another, and yet they are constantly used in their social and political sense as though their meaning were absolutely antagonistic. The word Evolution, synonymous with gradual and continuous development in morals and ideas, is brought forward in certain circles as though it were the antithesis of that fearful word, Revolution, which implies changes more or less sudden in their action, and entailing some sort of catastrophe. And yet is it possible that a transformation can take place in ideas without bringing about some abrupt displacements in the equilibrium of life? Must not revolution necessarily follow evolution, as action follows the desire to act? They are fundamentally one and the same thing, differing only according to the time of their appearance. If, on the one hand, we believe in the normal progress of ideas, and, on the other, expect opposition, then, of necessity, we believe in external shocks which change the form of society. It is this which I am about to try to explain, not availing myself of abstract terms, but appealing to the observation and experience of every one, and employing only such arguments as are in common use. No doubt I am one of persons known as "dreadful revolutionists;" for long years I have belonged to the legally infamous society which calls itself "The International Working Mens' Association," whose very name entails upon all who assume membership the treatment of malefactors; finally, I am amongst those who served that "execrable" Commune, "the detestation of all respectable men." But however ferocious I may be, I shall know how to place myself outside, or rather above my party, and to study the present evolution and approaching revolution of the human race without passion or personal bias. As we are amongst those whom the world attacks, we have a right to demand to be amongst those whom it hears. To begin with, we must clearly establish the fact, that if the word evolution is willingly accepted by the very persons who look upon revolutionists with horror, it is because they do not fully realise what the term implies, for they would not have the thing at any price. They speak well of progress in general, but they resent progress in any particular direction. They consider that existing society, bad as it is, and as they themselves acknowledge it to be, is worth preserving; it is enough for them that it realises their own ideal of wealth, power or comfort. As there are rich and poor, rulers and subjects, masters and servants, Caesars to command the combat, and gladiators to go forth and die, prudent men have only to place themselves on the side of the rich and powerful, and to pay court to Caesar. Our beautiful society affords them bread, money, place, and honour; what have they to complain of? They persuade themselves without any difficulty that every one is as well satisfied as they. In the eyes of a man who has just dined all the world is well fed. Toying with his tooth-pick, he contemplates placidly the miseries of the "vile multitude" of slaves. All is well; perdition to the starveling whose moan disturbs his digestion! If society has from his cradle provided for the wants and whims of the egotist, he can at all events hope to win a place there by intrigue and flattery, by hard work, or the favour of destiny. What does moral evolution matter to him? To evolve a fortune is his one ambition! But if the word evolution serves but to conceal a lie in the mouths of those who most willingly pronounce it, it is a reality for revolutionists; it is they who are the true evolutionists. Escaping from all formulas, which to them have lost their meaning, they seek for truth outside the teaching of the schools; they criticise all that rulers call order, all that teachers call morality; they grow, they develop, they live, and seek to communicate their life. What they have learned they proclaim; what they know they desire to practise. The existing state of things seems to them iniquitous, and they wish to modify it in accordance with a new ideal of justice. It does not suffice them to have freed their own minds, they wish to emancipate those of others also, to liberate society from all servitude. Logical in their evolution, they desire what their mind has conceived, and act upon their desire. Some years ago the official and courtly world of Europe was much in the habit of repeating that Socialism had quite died out. A man who was extremely capable in little matters and incapable in great ones, an absurdly vain parvenu, who hated the people because he had risen from amongst them, officially boasted that he had given Socialism its death-blow. He believed that he had exterminated it in Paris, buried it in the graves of Pere La Chaise. It is in New Caledonia at the Antipodes, thought he, that the miserable remnant of what was once the Socialist party is to be found. All his worthy friends in Europe hastened to repeat the words of Monsieur Thiers, and everywhere they were a song of triumph. As for the German Socialists, have we not the Master of Masters to keep an eye upon them, the man at whose frown Europe trembles? And the Russian Nihilists! Who and what are those wretches? Strange monsters, savages sprung from Huns and Bashkirs, about whom the men of the civilised West have no need to concern themselves! Nevertheless the joy caused by the disappearance of Socialism was of short duration. I do not know what unpleasant consciousness first revealed to the Conservatives that some Socialists remained, and that they were not so dead as the sinister old man had pretended. But now no one can have any doubts as to their resurrection. Do not French workmen at every meeting pronounce unanimously in favour of that appropriation of the land and factories, which is already regarded as the point of departure for the the new economic era? Is not England ringing with the cry, "Nationalisation of the Land," and do not the great landowners expect expropriation at the hands of the people? Do not political parties seek to court Irish votes by promises of the confiscation of the soil, by pledging themselves beforehand to an outrage upon the thrice sacred rights of property? And in the United States have we not seen the workers masters for a week of all the railways of Indiana, and of part of those on the Atlantic sea-board? If they had understood the situation, might not a great revolution have been accomplished almost without a blow? And do not men, who are acquainted with Russia, know that the peasants, one and all, claim the soil, the whole of the soil, and wish to expel their lords? Thus the evolution is taking place. Socialism, or in other words, the army of individuals who desire to change social conditions, has resumed its march. The moving mass is pressing on, and now no government dare ignore its serried ranks. On the contrary, the powers that be exaggerate its numbers, and attempt to contend with it by absurd legislation and irritating interference. Fear is an evil counsellor. No doubt it may sometimes happen that all is perfectly quiet. On the morrow of a massacre few men dare put themselves in the way of the bullets. When a word, a gesture are punished with imprisonment, the men who have courage to expose themselves to the danger are few and far between. Those are rare who quietly accept the part of victim in a cause, the triumph of which is as yet distant and even doubtful. Everyone is not so heroic as the Russian Nihilists, who compose manifestos in the very lair of their foes, and paste them on a wall between two sentries. One should be very devoted oneself to find fault with those who do not declare themselves Socialists, when their work, that is to say the life of those dear to them, depends on the avowal. But if all the oppressed have not the temprement of heroes, they feel their sufferings none the less, and large numbers amongst them are taking their own interests into serious consideration. In many a town where there is not one organised Socialist group, all the workers without exception are already more or less consciously Socialists; instinctively they applaud a comrade who speaks to them of a social state in which all the products of labour shall be in the hands of the labourer. This instinct contains the germ of the future Revolution; for from day to day it becomes more precise, transformed into distincter consciousness. What the worker vaguely felt yesterday, he knows today, and each new experience teaches him to know it better. And are not the peasants, who cannot raise enough to keep body and soul together from their morsel of ground, and the yet more numerous class who do not possess a clod of their own, are not all these beginning to comprehend that the soil ought to belong to the men who cultivate it? They have always instinctively felt this, now they know it, and are preparing to assert their claim in plain language. This is the state of things; what will be the issue? Will not the evolution which is taking place in the minds of the workers, i.e. of the great masses, necessarily bring about a revolution; unless, indeed, the defenders of privilege yield with a good grace to the pressure from below? But history teaches us that they will do nothing of the sort. At first sight it would appear so natural that a good understanding should be established amongst men without a struggle. There is room for us all on the broad bosom of the earth; it is rich enough to enable us all to live in comfort. It can yeild sufficient harvests to provide all with food; it produces enough fibrous plants to supply all with clothing; it contains enough stone and clay for all to have houses. There is a place for each of the brethren at the banquet of life. Such is the simple economic fact. What does it matter? say some. The rich will squander at their pleasure as much of this ealth as suits them; the middle-men, speculators and brokers of every description will manipulate the rest; the armies will destroy a great deal, and the mass of the people will have ahve the scraps that remain. "The poor we shall have always with us," say the contented, quoting a remark which, according to them, fell from the lips of a God. We do not care whether their God wished some to be miserable or not. We will re-create the world on a different pattern! "No, there shall be no more poor! As all men need to be housed and clothed and warmed and fed, let all have what is necessary, and none be cold or hungry!" The terrible Socialists have no need of a God to inspire these words; they are human, that is enough. Thus two opposing societies exist amongst men. They are intermingled, variously allied here and there by the people who do not know their own minds, and advance only to retreat; but viewed from above, and taking no account of uncertain and indifferent individuals who are swayed hither and thither by fate like waves of the sea, it is certain that the actual world is divided into two camps, those who desire to maintain poverty, i.e. hunger for others, and those who demand comforts for all. The forces in these two camps seem at first sight very unequal. The supporters of existing society have boundless estates, incomes counted by hundreds of thousands, all the powers of the State, with its armies of officials, soldiers, policemen, magistrates, and a whole arsenal of laws and ordinances. And what can the Socialists, the artificers of the new society, oppose to all this organised force? Does it seem that they can do nothing? Without money or troops they would indeed succumb if they did not represent the evolution of ideas and of morality. They are nothing, but they have the progress of human thought on their side. They are borne along on the stream of the times. The external form of society must alter in correspondence with the impelling force within; there is no better established historical fact. The sap makes the tree and gives it leaves and flowers; the blood makes the man; the ideas make the society. And yet there is not a conservative who does not lament that ideas and morality, and all that goes to make up the deeper life of man, have been modified since "the good old times." Is it not a necessary result of the inner working of men's minds that social forms must change and a proportionate revolution take place? Let each ascertain from his own recollections the changes in the methods of thought and action which have happened since the middle of this century. Let us take, for example, the one capital fact of the diminution of observance and respect. Go amongst great personages: what have they to complain of? That they are treated like other men. They no longer take precedence; people neglect to salute them; less distinguished persons permit themselves to possess handsomer furniture or finer horses; the wives of less wealthy men go more sumptuously attired. And what is the complaint of the ordinary man or woman of the middle-class? There are no more servants to be had, the spirit of obedience is lost. Now the maid pretends to understand cooking better than her mistress; she does not piously remain in one situation, only too grateful for the hospitality accorded her; she changes her place in consequence of the smallest disagreeable observation, or to gain two shillings more wages. There are even countries where she asks her mistress for a character in exchange for her own. It is true, respect is departing; not the just respect which attaches to an upright and devoted man, but that despicable and shameful respect which follows wealth and office; that slavish respect which gathers a crowd of loafers when a king passes, and makes the lackeys and horses of a great man objects of admiration. And not only is respect departing, but those who lay most claim to the consideration of the rest, are the first to compromise their superhuman character. In former days Asiatic sovereigns understood the art of causing themselves to be adored. Their palaces were seen from afar; their statues were erected everywhere; their edicts were read; but they never showed themselves. The most familiar never addressed them but upon their knees; from time to time a half-lifted veil parted to disclose them as if by a lightning flash, and then as suddenly enfolded them once more, leaving consternation in the hearts of all beholders. In those days respect was profound enough to result in stupifaction: a dumb messenger brought a silken cord to the condemned, and that sufficed, even a gesture would have been superfluous. And now we see sovereigns taking boxes by telegraph at the theatre to witness the performance of Orphee aux Enfers or The Grand Duchess of Gerolstein, that is to say, taking part in the derision of all which used to be held most worthy of respect- divinity and royalty! Which is the true regicide, the man who kills a sovereign, doing him the honour to take him as the representative of a whole society, or the monarch, who mocks at himself by laughing at the Grand Duchess or General Boum ? He teaches us at least that political power is a worm eaten institution. It has retained its form, but the universal respect which gave it worth has disappeared. It is nothing but an external scaffolding, the edifice itself has ceased to exist. Does not the spread of an education, which gives the same conception of things to all, contribute to our progress towards equality? If instruction were only to be obtained at school, governments might still hope to hold the minds of men enslaved; but it is outside the school that most knowledge is gained. It is picked up in the street, in the workshop, before the booths of a fair, at the theatre, in railway carriages, on steam boats, by gazing at new landscapes, by visiting foreign towns. Almost every one travels now, either as a luxury or a necessity. Not a meeting but people who have seen Russia, Australia, or America may be found in it, and if travellers who have changed continents are so frequently met with, there is, one may say, no one who has not moved about sufficiently to have observed the contrast between town and country, mountain and plain, earth and sea. The rich travel more than the poor, it is true; but they generally travel aimlessly; when they change countries they do not change surroundings, they are always in a sense at home; the luxuries and enjoyments of hotel life do not permit them to appreciate the essential differences between country and country, people and people. The poor man, who comes into collision with the difficulties of life without guide or cicerone, is best qualified to observe and remember. And does not the great school of the outer world exhibit the prodigies of human industry equally to rich and poor, to those who have called these marvels into existence and those who profit by them? The poverty-stricken outcast can see railways, telegraphs, hydraulic rams, perforators, self-lighting matches, as well as the man of power, and he is no less impressed by them. Privilege has disappeared in the enjoyment of some of these grand conquests of science. When he is conducting his locomotive through space, doubling or slacking speed at his pleasure, does the engine-driver believe himself the inferior of the sovereign shut up behind him in a gilded railway-carriage, and trembling with the knowledge that his life depends on a jet of steam, the shifting of a lever, or a bomb of dynamite? The sight of nature and the works of man, and practical life, these form the college in which the true education of contemporary society is obtained. Schools, properly so called, are relatively much less important; yet they, too, have undergone their evolution in the direction of equality. There was a time, and that not very far distant, when the whole of education consisted in mere formulas, mystic phrases, and texts from sacred books. Go into the Mussel school opened beside the mosque. There you will see children spending whole hours in spelling or reciting verses from the Koran. Go into a school kept by Christian priests, Protestant or Catholic, and you will hear silly hymns and absurd recitations. But even in these schools the pressure from below has caused this dull routine to be varied with a new sort of instruction; instead of nothing but formulas the teachers now explain facts, point out analogies and trace the action of laws. Whatever the commentaries with which the instructor accompanies his lessons, the figures remain none the less incorruptible. Which education will prevail? That according to which two and two make four, and nothing is created out of nothing; or the odd education according to which everything comes from nothing and three persons make only one? The elementary school, it is true, is not all: it is not enough to catch a glimpse of science, one should be able to apply it in every direction. Therefore Socialistic evolution renders it necessary that school should be a permanent institution for all men. After receiving "general enlightenment" in a primary school, each ought to be able to develop to the full such intellectual capacity as he may possess, in a life which he has freely chosen. Meanwhile let not the worker despair. Every great conquest of science ends by becoming public property. Professional scientists are obliged to go through long ages of research and hypothesis, they are obliged to struggle in the midst of error and falsehood; but when the truth is gained at length, often in spite of them, thanks to some despised revolutionists, it shines forth clear and simple in all its brilliance. All understand it without an effort: it seems as if it had always been known. Formerly learned men fancied that the sky was a round dome, a metal roof-or better still-a series of vaults, three, seven, nine, even thirteen, each with its procession of stars, its distinct laws, its special regime and its troops of angels and archangels to guard it! But since these tiers of heavens, piled one upon the other, mentioned in the Bible and Talmud, have been demolished, there is not a child who does not know that round the earth is infinite and unconfined space. He hardly can be said to learn this. It is a truth which henceforward forms a part of the universal inheritance. It is the same with all great acquisitions, especially in morals and political economy. There was a time when the great majority of men were born and lived as slaves, and had no other ideal than a change of servitude. It never entered their heads that "one man is as good as another." Now they have learnt it, and understand that the virtual equality bestowed by evolution must be changed into real equality, thanks to a revolution. Instructed by life, the workers comprehend certain economic laws much better than even professional economists. Is there a single workman who remains indifferent to the question of progressive or proportional taxation, and who does not know that all taxes fall on the poorest in the long run ? Is there a single workman who does not know the terrible fatality of the "iron law," which condemns him to receive nothing but a miserable pittance, just the wage: that will prevent his dying of hunger during his work? Bitter experience has caused him to know quite enough of this inevitable law of political economy. Thus, whatever be the source of information, all profit by it, and the worker not less than the rest. Whether a discovery is made by a bourgeois, a noble, or a plebeian, whether the learned man is Bernard Palissy, Lord Bacon, or Baron Humboldt, the whole world will turn his researches to account. Certainly the privileged classes would have liked to retain the benefits of science for themselves, and leave ignorance to the people, but henceforth their selfish desire cannot be fulfilled. They find themselves in the case of the magician in "The Thousand and One Nights," who unsealed a vase in which a genius had been shut up asleep for ten thousand years. They would like to drive him back into his retreat, to fasten him down under a triple seal, but they have lost the words of the charm, and the genius is free for ever. This freedom of the human will is now asserting itself in every direction; it is preparing no small and partial revolutions, but one universal Revolution. It is thoughout society as a whole, and every branch of its activity, that changes are making ready. Conservatives are not in the least mistaken when they speak in general terms of Revolutionists as enemies of religion, the family and property. Yes; Socialists do reject the authority of dogma and the intervention of the supernatural in nature, and, in this sense however earnest their striving for the realisation of their ideal, they are the enemies of religion. Yes; they do desire the suppression of the marriage market; they desire that unions should be free, depending only on mutual affection and respect for self and for the dignity of others, and, in this sense, however loving and devoted to those whose lives are associated with theirs, they are certainly the enemies of the legal family. Yes; they do desire to put an end to the monopoly of land and capital, and to restore them to all, and, in this sense, however glad they may be to secure to every one the enjoyment of the fruits of the earth, they are the enemies of property. Thus the current of evolution, the incoming tide, is bearing us onward towards a future radically different from existing conditions, and it is vain to attempt to oppose obstacles to destiny. Religion, by far the most solid of all dikes, has lost its strength: cracking on every side, it leaks and totters, and cannot fail to be sooner or later overthrown. It is certain that contemporary evolution is taking place wholly outside Christianity. There was a time when the word Christian, like Catholic, had a universal signification, and was actually applied to a world of brethren, sharing, to a certain extent, the same customs, the same ideas, and a civilisation of the same nature. But are not the pretensions of Christianity to be considered in our day as synonymous with civilisation, absolutely unjustifiable? And when it is said of England or Russia that their armies are about to carry Christianity and civilisation into distant regions, is not the irony of the expression obvious to every one? The garment of Christianity does not cover all the peoples who by right of culture and industry form a part of contemporary civilisation. The Parsees of Bombay, the Brahmins of Benares eagerly welcome our science, but they are coldly polite to the Christian Missionaries. The Japanese, though so prompt in imitating us, take care not to accept our religion. As for the Chinese, they are much too cunning and wary to allow themselves to be converted. "We have no need of your priests," says an English poem written by a Chinese, "We have no need of your priests. We have too many ourselves, both long-haired and shaven. What we need is your arms and your science, to fight you and expel you from our land, as the wind drives forth the withered leaves!" Thus Christianity does not nominally cover half the civilised world, and even where it is supposed to be paramount, it must be sought out; it is much more a form than a reality, and amongst those who are apparently the most zealous, it is nothing but an ignoble hypocrisy. Putting aside all whose Christianity consists merely in the sprinkling of baptism or inscription on the parish register, how many individuals are there whose daily life corresponds with the dogmas they profess, and whose ideas are always, as they should be, those of another world? Christians rendered honourable by their perfect sincerity may be sought without marked success even in "Protestant Rome," a city, nevertheless, of mighty traditions. At Geneva as at Oxford, as at all religious centres, and everywhere else, the principal preoccupations are non-ecclesiastical; they lean towards politics, or, more often still, towards business. The principal representatives of so-called Christian society are Jews, "the epoch's kings." And amongst those who devote their lives to higher pursuits--science, art, poetry--how many, unless forced to do so, occupy themselves with theology? Enter the University of Geneva. At all the courses of lectures--medicine, natural history, mathematics, even jurisprudence--you will find voluntary listeners; at every tone except at those upon theology. The Christian religion is like a snow-wreath melting in the sun: traces are visible here and there, but beneath the streaks of dirty white the earth shows, already clear of rime. The religion which is thus becoming detached, like a garment, from European civilisation, was extremely convenient for the explanation of misery, injustice, and social inequality. It had one solution for everything-miracles. A Supreme will had pre-ordained all things. Injustice was an apparent evil, but it was preparing good tilings to come. "God giveth sustenance to the young birds. He prepareth eternal blessedness for the afflicted. Their misery below is but the harbinger of felicity on high!" These things were ceaselessly repeated to the oppressed as long as they believed them; but now such arguments have lost all credence, and are no longer met with, except in the petty literature of religious tracts. What is to be done to replace the departing religion? As the worker believes no longer ill miracles, can he perhaps be induced to believe in lies? And so learned economists, academicians, merchants, and financiers have contrived to introduce into science the bold proposition that property and prosperity are always the reward of labour! It would be scarcely decent to discuss such an assertion. When they pretend that labour is the origin of fortune, economists know perfectly well that they are not speaking the truth. They know as well as the Socialists that wealth is not the product of personal labour, but of the labour of others: they are not ignorant that the runs of luck on the Exchange and the speculations which create great fortunes have no more connection with labour than the exploits of brigands in the forests; they dare not pretend that the individual who has five thousand pounds a day, just what is required to support one hundred thousand persons like himself, is distinguished from other men by an intelligence one hundred thousand times above the average. It would be scandalous to discuss this sham origin of social inequality. It would be to be a dupe, almost an accomplice, to waste time over such hypocritical reasoning. But arguments of another kind are brought forward, which have at least the merit of not being based upon a lie. The right of the strongest is now evoked against social claims. Darwin's theory, which has lately made its appearance in the scientific world, is believed to tell against us. And it is, in fact, the right of the strongest which triumphs when fortune is monopolised. He who is materially the fittest, the most wily, the most favoured by birth, education, and friends; he who is best armed and confronted by the feeblest foe, has the greatest chance of success; he is able better than the rest to erect a citadel, from the summit of which he may look down on his unfortunate brethren. Thus is determined the rude struggle of conflicting egoisms. Formerly this blood-and-fire theory was not openly avowed; it would have appeared too violent, and honied words were preferable. But the discoveries of science relative to the struggle between species for existance and the survival of the fittest, have permitted the advocates of force to withdraw from their mode of expression all that seemed too insolent. "See, they say, "it is an inevitable law! Thus decrees the fate of mankind!" We ought to congratulate ourselves that the question is thus simplified, for it is so much the nearer to its solution. Force reigns, say the advocates of social inequality! Yes, it is force which reigns! proclaims modern industry louder and louder in its brutal perfection. But may not the speech of economists and traders be taken up by revolutionists? The law of the strongest will not always and necessarily operate for the benefit of commerce. "Might surpasses right," said Bismark, quoting from many others; but it is possible to make ready for the day when might will be at the service of right. 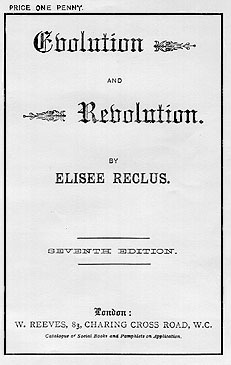 If it is true that ideas of solidarity are spreading; if it is true that the conquests of science end by penetrating the lowest strata; if it is true that truth is becoming common property; if evolution towards justice is taking place, will not the workers, who have at once the right and the might, make use of both to bring about a revolution for the benefit of all? What can isolated individuals, however strong in money, intelligence, and cunning, do against associated masses? In no modern revolution have the privileged classes been known to fight their own battles. They always depend on armies of the poor, whom they have taught what is called loyalty to the flag, and trained to what is called "the maintenance of order." Five millions of men, without counting the superior and inferior police, are employed in Europe in this work. But these armies may become disorganised, they may call to mind the nearness of their own past and future relations with the mass of the people, and the hand which guides them may grow unsteady. Being in great part drawn from the proletariat, they may become to bourgeois society what the barbarians in the pay of the Empire became to that of Rome-an element of dissolution. History abounds in examples of the frenzy which seizes upon those in power. When the miserable and disinherited of the earth shall unite in their own interest, trade with trade, nation with nation, race with race; when they shall fully awake to their sufferings and their purpose, doubt not that an occasion will assuredly present itself for the employment of their might in the service of right; and powerful as may be the Master of those days, he will be weak before the starving masses leagued against him. To the great evolution now taking place will succeed the long expected, the great revolution. It will be salvation, and there is none other. For if capital retains force on its side, we shall all be the slaves of its machinery, mere bands connecting iron cogs with steel and iron shafts. If new spoils, managed by partners only responsible to their cash books, are ceaselessly added to the savings already amassed in bankers' coffers, then it will be vain to cry for pity, no one will hear your complaints. The tiger may renounce his victim, but bankers' books pronounce judgments without appeal. From the terrible mechanism whose merciless work is recorded in the figures on its silent pages, men and nations come forth ground to powder. If capital carries the day, it will be time to weep for our golden age; in that hour we may look behind us and see like a dying light, love and joy and hope-all the earth has held of sweet and good. Humanity will have ceased to live. As for us, whom men call "the modern barbarians," our desire is justice for all. Villains that we are, we claim for all that shall be born, bread, liberty, and progress.